Doctor Who: Revisiting THE CURSE OF FENRIC | Warped Factor - Words in the Key of Geek. Matthew Kresal heads to Maiden's Point. There is a saying about going out on top. Doctor Who found itself coming to an unexpected end in 1989 with some of the original series best stories. Among them would be The Curse Of Fenric. With its 2003 DVD release, the penultimate story of the classic series can be viewed not only in its original form but in an expanded special edition that presents the story more akin to the way it was originally intended. The result is a unique release of one of the best Doctor Who stories ever. Any good production must have a good cast and this one has one of the best of the series. 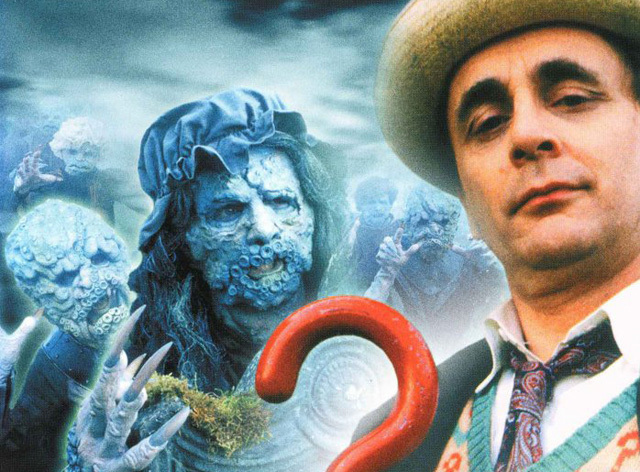 The performances start with the regulars: Sylvester McCoy as the Doctor and Sophie Aldred as Ace. McCoy gives his single best Doctor Who performance in this story as he strikes just the right balance between his more comedic Doctor of season 24 and the more serious Doctor of season 25 and earlier in season 26. Just look at the final episode (or the last half-hour of the special edition) to see McCoy at his best. Sophie Aldred also gives one of her best performances as Ace. This was the middle story of what has become known to fans as the "Ace Trilogy" (the other two stories being Ghost Light and Survival) due to their heavy focus on Ace and giving Aldred a chance to show off her skills as an actress. Aldred doesn't disappoint with a strong performance as the companion who discovers that her past is interlinked with events unfolding around her. Despite their excellent performances, McCoy and Aldred are just the tip of the cast. There is also an excellent supporting cast. There's Dinsdale Landen as Dr. Judson, the crippled computer scientist who unleashes the title and effectively embodies it. Alfred Lynch gives an excellent performance as the obsessive Commander Millington who grows more and more paranoid as the story unfolds. There are equally excellent performances from Tomek Bork as Soviet Captain Sorin, plus Joann Kenny and Joanne Belll as the two teenagers Jean and Phyllis. Even the smaller roles are filled with good actors and actress like Anne Reid (Nurse Crane), Steven Rimkus (Captain Bates), Janet Henfrey (Mrs. Hardaker) and Raymond Trickett (the Ancient One). 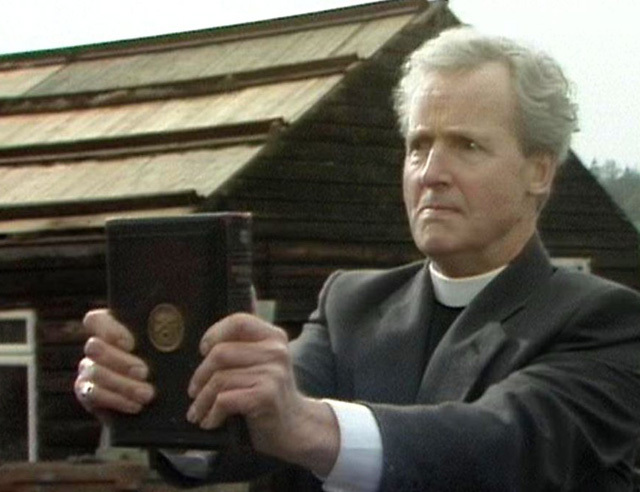 The true highlight of the supporting cast is Nicholas Parsons as Reverend Wainwright. Parsons, who is better known in the UK for his game-show hosting, gives one of the best performances of the McCoy era as the priest who loses his faith and pays for it. There is a wonderful scene where he is giving a sermon to an empty church that illustrates this beautifully, and gives Parsons his best moment in the story. All together they form one of the show's best casts. The story also has some strong production values as well. From the outset, we get a rather well-done recreation of a WWII era army camp complete with trappings of the time (including a fantastic looking 1940's computer). Then there are the Haemovores: the vampire possible future evolution of humanity brought back into our recent past. 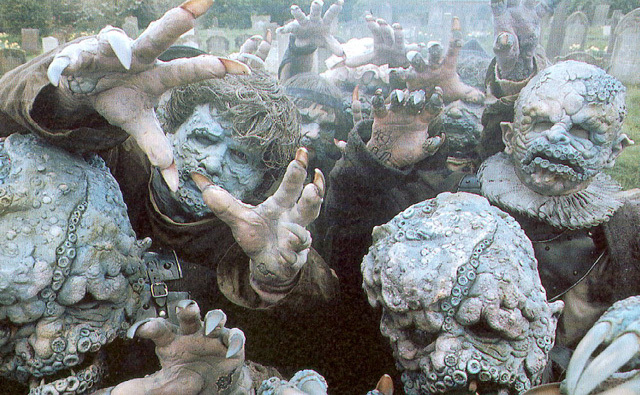 The Haemovores, especially the Ancient One, are amongst the best monsters ever designed for the show as they are incredibly spooky and convincing. Couple this with the underwater filming and excellent location work, and the result is a story that proves that under the right conditions a low budget can be overcome. Then there's the heart of it all: the script. The Curse of Fenric is a story with many threads and layers. It's a story about war and faith that explores the nature of evil plus the lengths one must go to fight it. On top of all that, there is the obvious horror aspect in the form of the Haemovores. Ian Briggs also manages to tie together stories from the McCoy era (such as Silver Nemesis and Dragonfire) to explore the background and character of Ace. 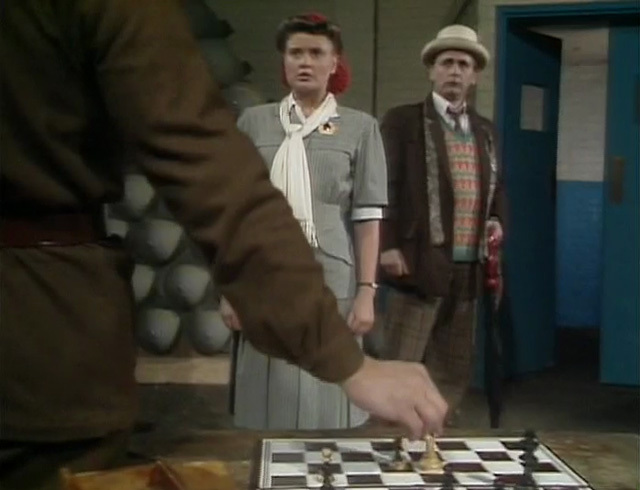 Above all, it is a sort of chess game between the Doctor and an ancient enemy named here as Fenric, in which all the other characters act as their pawns. This is a story where one must watch to get everything that is going on, making this not only an action story but one of the show's most cerebral as well. It is because of its complexity that the special edition is worth watching. The DVD release from over a decade ago is packed with special features, including interviews, commentaries, making-of features and so forth, but the true star of this release is the "special edition" of the story. This version is movie length with new scenes, CGI effects and a 5.1 soundtrack which makes it the superior of the two versions. The new scenes add a depth to the story, expand on the backgrounds of some characters and the actions of others. The result is a classic Doctor Who adventure made all the better, and this version of the story alone is worth the price of the DVD. The Curse Of Fenric is Doctor Who at its finest, or very close to it. It's defiantly the best story of the McCoy television era at any rate, with its strong performances, good production values and strong script. The DVD release, with the special edition, is the definitive version of this classic Doctor Who adventure. Believe what you've heard: The Curse Of Fenric is excellent.